At the Tenmangu Shrine in Tsuruoka town, Yamagata. 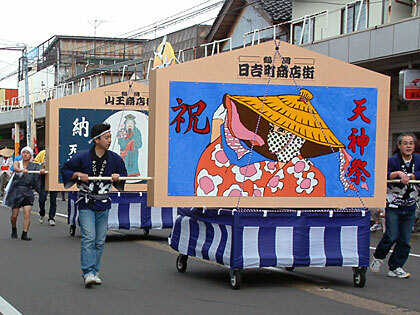 Men and women dress up in fancy costumes and parade in the town. 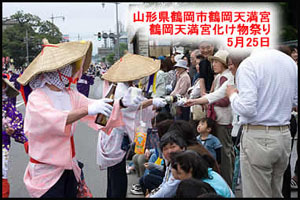 Dressed with faces covered and a large straw hat, they speak no word and pour sake ricewine or soft drinks for the onlookers. Is someone can take part in this parade without being recognized by anyone, his/her wish will be granted. In former times, these "monsters" used to enter the homes of parishioners and invite all to drink with them. This festival reminds of the time when Sugawara Michizane was taken to exile. People in Kyoto did not dare to show compassion for him, so they did not speak and dressed up and covered their faces when he was paraded through the town, to show their sympathy for him.
. Sugawara Michizane　菅原道真 . 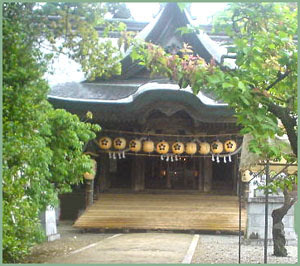 The shrine in Yamagata was founded in 1603 by Lord Mogami Yoshiaki 最上義光, near the West Gate of his castle, to protect it from evil influence. It is dedicated to Michizane, Deity of Learning, but also to pray for a good harvest, protection from fire and disaster and lead a happy life. Sailors pray for a safe trip 渡海無事. 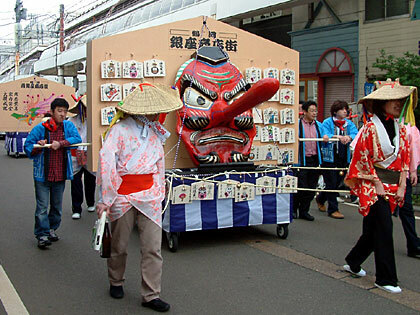 Tengu dance and lion dance are offered. Tsuruoka Town (鶴岡市, Tsuruoka-shi) is a city located in the Shonai region of Yamagata Prefecture, Japan. The city is located on the coast of Yamagata Prefecture bordering the Sea of Japan and has some locally popular beaches such as Yunohama and Sanze. Tsuruoka is known within Japan for "dadacha-mame" (だだちゃ豆), a brand of soybeans, which have been called "the king of edamame"; they are also used for other products such as nattō and in manjū. There are two theories as to the origin of the name: one is that it derives from dadacha, the Shonai dialectical word for "father" – gagacha is the dialectical word for "mother", while the other is that the beans came from Date, Fukushima, and were originally called Date-no-chamame, which became Date-chamame and then Dadacha-mame.
. Ema 絵馬　Votive Plaques, Votive Tablets .